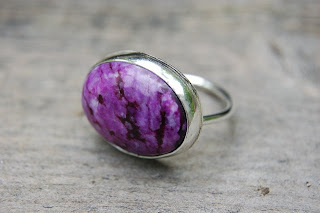 I'm having a Give Away this month and the lucky winner will receive one of my bezel set purple Jasper rings!! A value of $59 dollars. The deadline will be August 9th. i'd love to be included in the drawing list!!! That color is unbelievable! Count me in too. Oh, I so want to win this ring! It is gorgeous! Thanks for the giveaway!! What a beautiful ring I love the silver and purple .My fingers are crossed that I win.Greeting from Canada. It has the most gorgeous color ever!!! Just visited your Etsy shop-- lovely!! I hearted you and hopefully when my own sales pick up I can come back again and treat myself to one of your gorgeous items! that is such a great purple color! The ring is gorgeous! Whoever wins it will be lucky indeed. I'd love to be included in this giveaway. That purple is very rich and I like the simplicity of the ring. Nice job. What a lovely ring. I really like the color. I am in love with that ring. waaah i want! I lost my amethyst & silver ring awhile back & miss the purple on my hand. A very generous giveaway... I'd love to wear this gorgeous thing. Oh gosh, I LUUUURVE jasper, but PURPLE (one of my favourite colours!) jasper? I ain't even ever heard of that! It's gorgeous! Gorgeous ring -- and purple is one of my favorite colors :) *Thanks* for the giveaway! Beautiful color on the stone...so deep and rich. Thanks for the chance to win. Your jewelry is BEAUTIFUL! I love natural stone with silver. I have added you as a favorite! The ammonite pendant is my favorite! oh, wow. that colour is unbelieveable! such a generous giveaway, hope I win, hehe. This is an absolutely gorgeous ring. I have done lapidary work/silversmithing myself, and do appreciate the combination of the purple against the silver and the work involved. Gorgeous color and obviously well-crafted - thank you for the opportunity! What a beautiful ring to give away! Thanks! Me and my daughter love the ring! Such awesome color! Beautiful ring, and thanks! There a very few words that can aptly describe the beauty of this ring! It is beyond stunning. Thanks for the entry! love this! i'll give to my mom if ever, in her 50th birthday! i want this as my peace offering to my girlfriend! i lnow know she will forgove me with this! nice ring for a hardworking hands such ours! nice one! the color is very elegant! good craftsmanship! I love this ring! The colour is so striking! I've got my fingers crossed that I win since my wedding rings have given me a terrible rash (apparently the gold is mixed with nickle) :( and I can't wear them. My fingers are feeling naked!!! Oh my god, I would wear that EVERY day! So pretty! thanks for the great contest that jasper ring is gorgeous ~ what a great color! The ring is eye catching. Would love to see it in person! Thank you for the giveaway :) the ring looks amazingly beautiful! I have a dress that would go well with that gorgeous ring. Purple is my favorite color! I love the ring! this ring is just stunning! all of your pieces are, actually. please count me in on this fabulous giveaway! i love rings, please include me as well. BTW is this open worldwide? please say yes!!! Whew! Loads of entries! Thanks so much for participating! Gorgeous ring Sabine! Beautiful Etsy shop as well! This is a really gorgeous ring and perfect color for my college - Northwestern University! Wow! This is a gorgeous ring! this purple ring is trully one of a kind... my mom will acytually wear this the whole day! love the simplicity yet elegance of this piece of ms. sabine's craftsmanship! best as gift- for your loveone and for yourself! I am a purple fan. Love this ring! gorgeous ring and color! thanks for the chance! Purple is my favorite color and this ring is beautiful! That is simply stunning, how lovely of you to offer it up as a prize to the blog loving masses! If I were to win that little piece of art, it would be going to my Mother, she came to mind the moment I saw it - all her jewelery is silver & purple is her colour, she deserves something special, and a little bit magic... ;) she would be beside herself! so pretty! please enter me!! wow! so pretty! love the purple!! so pretty!! my mom would love this!! fingers crossed!! this is so lovely!! hope i win!! Gorgeous ring, and such a lovely color. The bezel setting really lets the beauty of the stone shine. Ooh, that's really pretty, I'd love to win. Thanks for offering it. i love jasper. that is a pretty ring! Beautiful ring, love that its purple. This ring is stunning! Keeping my fingers crossed... Thanks for the chance to win. Oops! Forgot to leave my email addy just in case! I have this ring on my favorites list in Etsy! Beautiful! Beautiful and my favourite colour!! wow what a gift ! Beautiful ring, thank you! This ring is really beautiful and purple is my favorite color! Purple is my favorite color too! My room is painted a warm amethyst. I really want to win! all your jewelry is stunning.